Discussion in 'Ducks' started by Wokawidget, Aug 9, 2009. 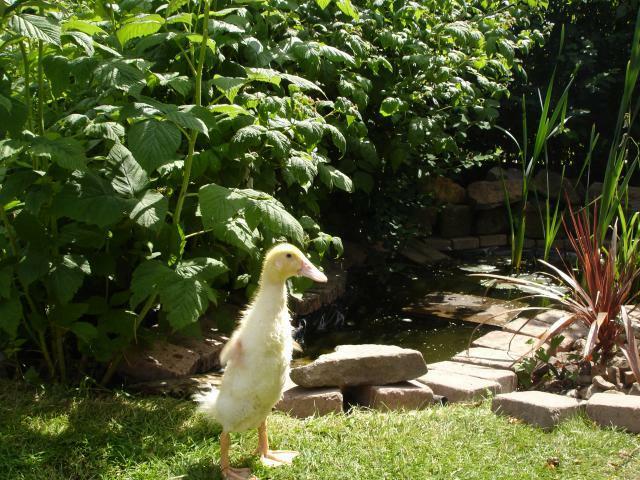 I have a 3 month old white Campbell duck, who has 3 chicken friends. Silliest thing ever. She's pretty quiet most of the time...unless I play fight with her or feed her some tasty treats. She's certainly not going to annoy the neighbours. How loud are runner ducks? Will adding a runner duck to my Campbell cause critical mass, which will end up in them quaking their heads off together and driving everyone to eat they own head? I live in an Urban area, and not the country, so noise is a massive factor. We have 5 Runners, and they are pretty quiet for the most part. The females quack like crazy when they hear my daughter's voice because they know food is on the way. They will also quack quite a bit when the dog runs by the run or they get startled. The males barely make any noise, and when they do it is like a muffled croak. Yea, males are certainly way quieter! 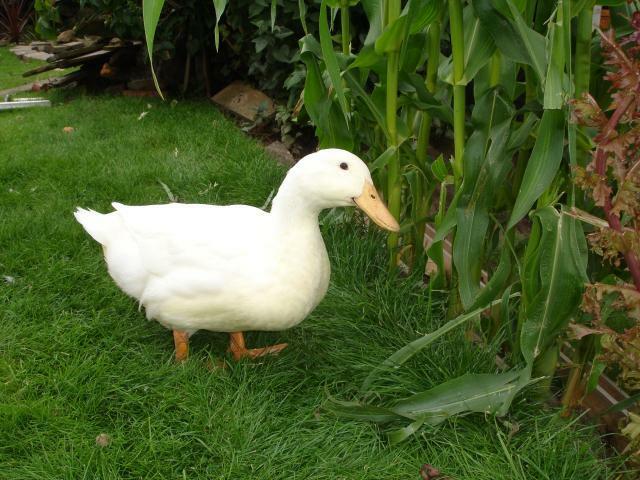 We definately want a female duck for her egg laying abilities. So we should just hear background quacks then not them both going nuts because they can? My runner girls quack more and more as they get older! They quack when the drake is ___ with another duck. They quack when he's ____ with a chicken. They quack if one gets too far away from the others. Ling Ling Quacks ALL THE TIME!!!! If the windows are open and I cough, WACK WACK WACK WACK WACK! If I sneeze, WACK WACK WACK WACK WACK! IF she hears my voice, if their food bowl needs filled.... You get the idea. 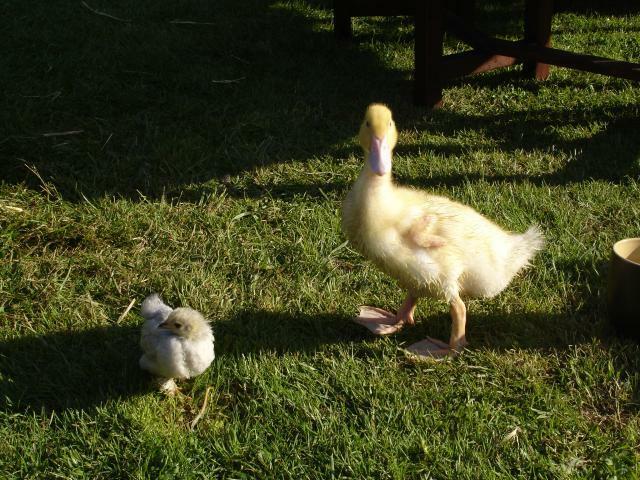 But I can't remember if she was this loud before my other Runner duck Cinder was killed. I know that as soon as Cinder was gone Ling Ling started quacking like crazy in groups of 3. WACK WACK WACK. I am certain this is how she would call Cinder. I did giver her extra attention between when Cinder died, and when I got her a new friend. I'm wondering if that is why she does this now. I'm afraid she's going to annoy the neighbors. I don't know how to get her to stop the mad quacking. I'd like to get a couple more runners, but I'm afraid of the noise factor. I think it depends on the duck for the noise factor. We have 14 ducks now (along with 15 chickens and 4 guineas) on 1 1/2 acres. My neighbors say they can't hear them unless they are outside and none of them mind the noise. Our broody runners were definitely more noisy, or if they are running from you they can get noisy. 2 ducks shouldn't be too bad on the noise factor. And of course drakes are quieter. I haven't seen a white Campbell, but I have seen a picture. They are pretty. My Cambell, called Boggling is quiet normally...but if she gets a sniff that you may have food, or she's play fighting with me, then she's quite a loud accoustic noise generator. As requested, here's some pictures of Boggling. Those are great pics, really cute!! I had to click on the photos to make them big enough to really see. She kinda looks like a young pekin, but her neck is different.